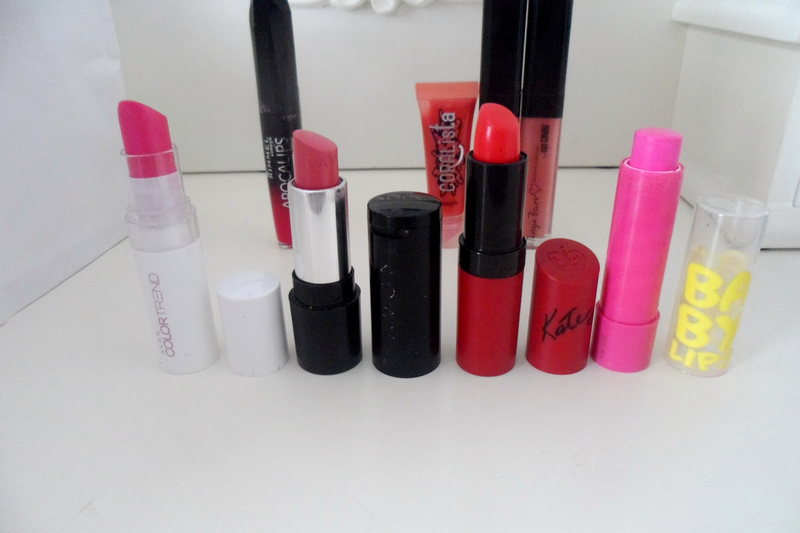 However I thought I would share the pink lipsticks I've been loving! Avon (the description has rubbed off so I have no idea what its called) in Pink Crush, this is a lovely more neutral pinky colour and when I used to work in retail I know this was the only pink I wore as it's such a lovely subtle colour. Kate Moss by Rimmel in 110, this colour has more of a coral colour to it however I do find it sometimes looks more pink than coral so hense why it's thrown in here. 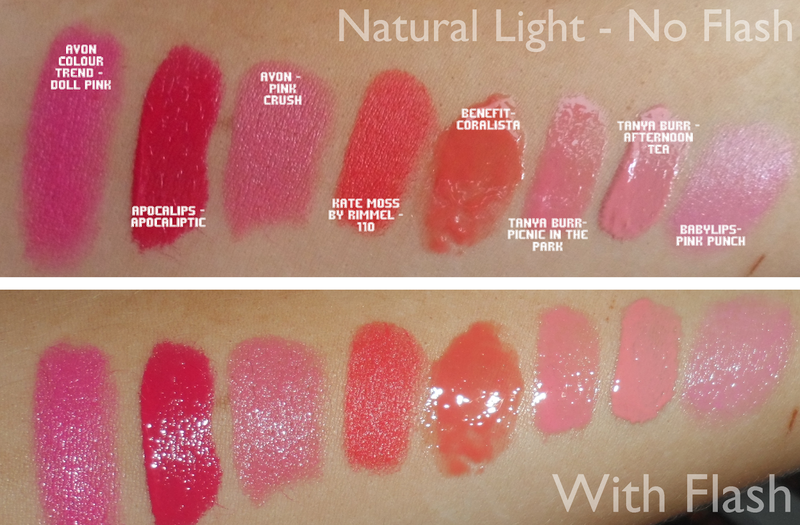 This is such a beautiful creamy lippy to apply and does last awhile before you have to re-apply. Baby Lips in Pink Crush, more so for a day when I don't feel like putting much effort into my makeup as it just gives a lovely hint of pink to your lips. Apocalips in the colour Apocaliptic, okay so you either love this product or hate it I for one love them! The fact that they're just so long wearing is amazing. I will admit though I find them quite messy when you apply it first and think I get it everywhere else more so than on my lips but when I finally master getting it on I love it. Coralista by Benefit, (again another coral colour but I normally wear this over Kate 110 so decided why not include it) honestly this isnt a product I would be putting straight in my basket so when it came in my 'It's a Love fest set' (post here) it wasn't something I tried straight away. However after some time I decided to try it over my Kate Moss lippy and it is such a perfect colour to go with it! Tanya Burr Lipgloss in Picnic in the Park, (I'm not going to say a crazy amount about this product due to already have done a blog post on them which you can find here) these lipglosses are so pigmented and buildable and they smell amazing and they don't have that over sticky feeling a lipgloss normally has. Looks so beautiful on! Tanya Burr Lipgloss in Afternoon Tea, again so pigmented and smells amazing! Lighter colour than the previous and looks absolutely gorgeous on! 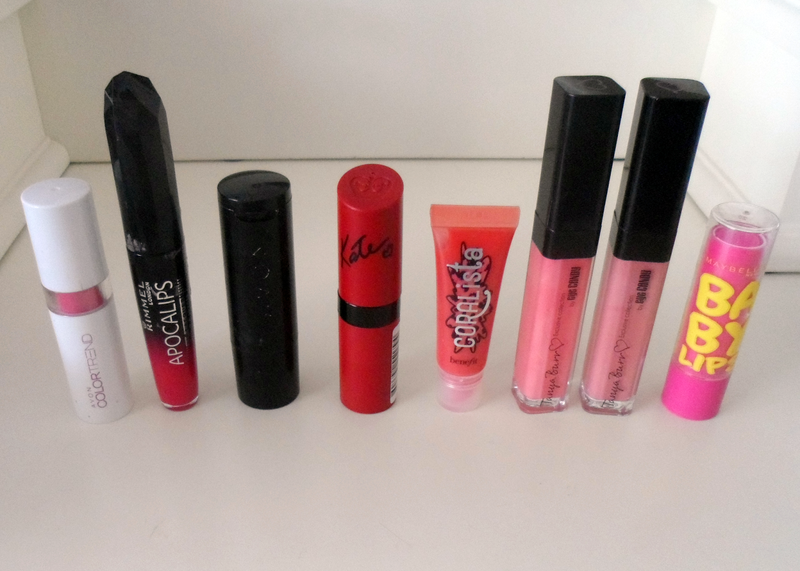 Whats your favourite colour to wear on your lips? Gorgeous colours, I love pink lipstick and lipgloss too! I love your blog and I have followed you with Bloglovin, if you ever get a chance to check out my blog I would be delighted, thanks! I love the Rimmel Apocalips. great staying power and pigmentation.